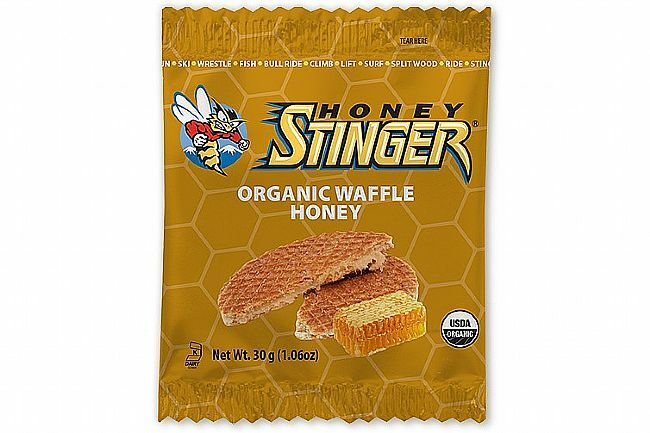 The Honey Stinger Organic Waffle is a delicious approach to on-the-bike or post-ride nutrition. Based on a popular Dutch snack, this sweet treat is a favorite of pro racers throughout Europe. USDA certified organic ingredients taste great and deliver the energy you need to ride harder and train longer. 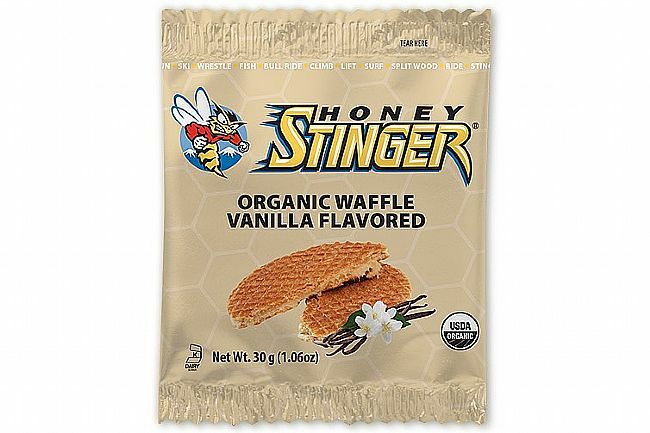 Honey Stinger Organic Waffles are sold in boxes of 16 waffles. Available in multiple flavors. This is a great tasting energy boost for any occasion, especially for bike rides. It's thin and lightweight, so easily carried in a jersey pocket or bike bag. A quick energy boost, along with the Stinger Energy Chews (that don't stick to your teeth). Lots of good flavors and cheaper by the box. These taste okay, but crumble! 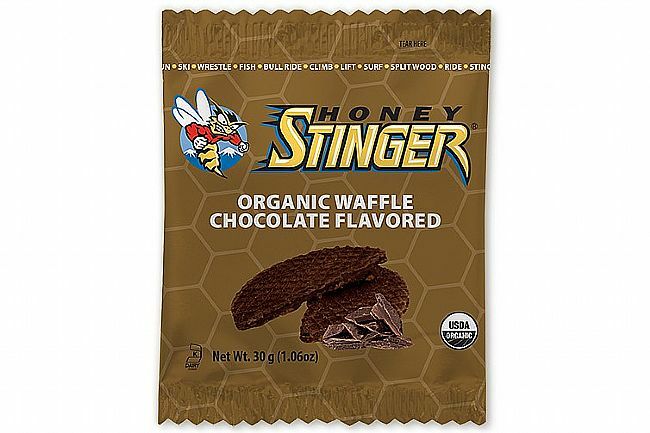 I had enjoyed Honey Stingers a year ago, but the new organic version is really disappointing. Hard - no, impossible - to open while moving, so I rip the package open before the ride. No big deal, but these wafers are dry and they crumble when I try to eat them. I guess I lose one-third of each wafer as it falls apart and onto the asphalt. I really miss the honey-like consistency of the original, and won't get these again. I discovered these while training for IM Canada a few years back, when I found out they'd be on the course. These are easy on my stomach and pack 150-160 cals per package, which fit in my top-tube carrier or back pocket pretty easily. Sometimes they're just my go-to snack. Tastes great. And gives a nice boost. But doesn't last as long as shot blocks, etc. in terms of extended energy. Get em as that tasty snack to go with that nasty (more powerful) gel. Honey Stinger is a great treat during my rides. It is tasty, filling and easy to carry. I often spread some peanut butter on it at an organized ride. Yummy! These are a natural tasting alternative to the usual pure sugar bike energy snacks. i rate the value lower because in belgium, these are better AND less expensive. the overall is good, fits jersey pockets well and eats easily and tastes good. the only negative is that the packaging either comes open easily 25% of the time or it's difficult to open 75% of the time. when eating on the bike, a wrapper should tear easily and stay in 1 piece...this fails to do that well. Tasty but not over the top sugar bomb. These are great on the bike, quick energy gels... they are tasty but not so sugary that you feel like you are going to go into convulsions like some of the other energy blocky-gelly things can do. Since trying these, I haven't used any other brand, except in an extreme bonk emergency. Plus, if act now you might get the limited edition box with a picture of the world's best doper on it! these honey stingers are excellent. great quick energy, not all sticky, easily digested and go down fast with a little sip of water. and given Lance's current troubles purchase of these likely contributes to him staying off unemployment! I get them as a small treat that I eat before ridding. They taste great and are easy to stuff in the back of your jersey. Tasty. Nice snack for a rest stop. Too hard to open package when riding. Waffles have a tendency to crumble. 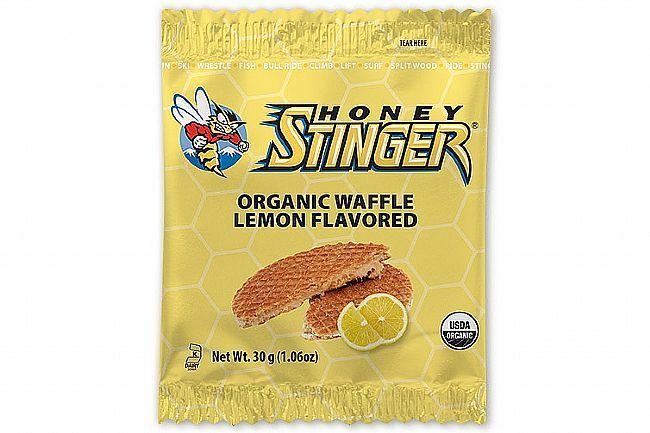 Since Power Bar discontinued my favorite energy bar flavor a couple of years ago, I've discovered Honey Stingers and haven't looked back since. 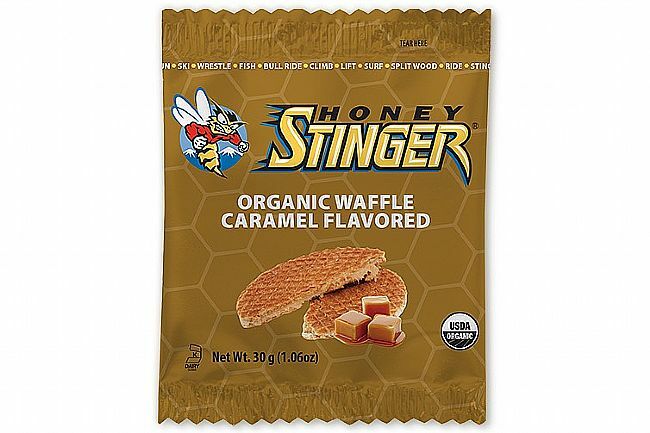 My favorite Honey Stinger's flavor is Caramel, however I like the other flavors that I've tried so far. These are great and the fact that the size fits perfect in a jersey pocket you can fit three or more and not be bulky. Taste is great but they are messy and crumble all over, as to the energy, I would say similar to other single serve cycling products but natural is good and no upset stomach. I find these waffles a lot more satisfying than your typical gels (and even most bars), but they are a bit bulky in the jersey pocket. If you're only going to carry one or two, they're a nice change from gels and chews, but if you're doing a long ride, it's hard to carry enough to get the calories needed. I'd definitely recommend them as a nice option to other products. The strawberry ones are good ....but I like the Honey ones better!